Place bones, wider cut side down, in an ovenproof skillet or roasting pan. Drizzle bones with rendered lard or oil. Roast bones until marrow is soft and begins to separate from bone but before it begins to melt, 15-20 minutes, depending on thickness of bones. The bones should appear golden-brown when finished. Meanwhile, toss parsley, shallots, olive oil, horseradish, lemon juice, and capers in a medium bowl to coat. Season salad to taste with sea salt and pepper. 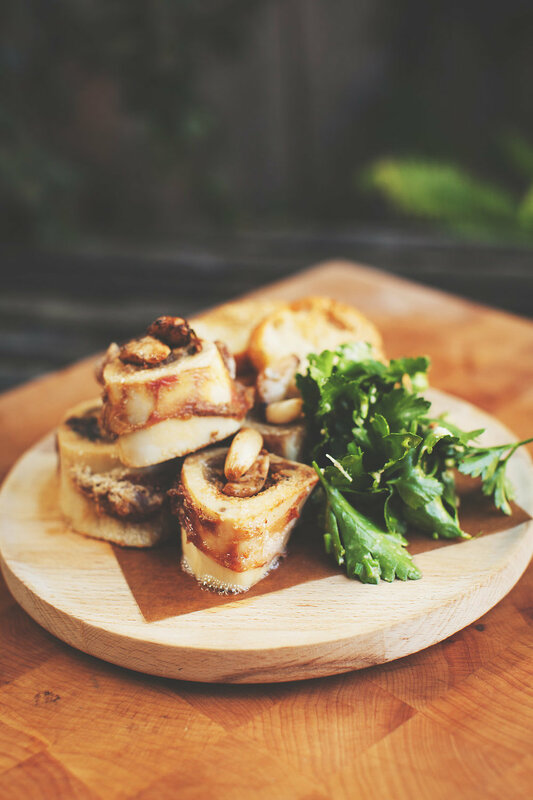 Using a long thin spoon or butter knife, scoop the marrow onto the toast, top with salad, and garnish with a pinch or two of sea salt and black pepper.